This is as far as I’ve got with this wall art panel at the moment. I had set up embroideries for the Jacob’s Creek winery logo and the serve speed readout. I tested each embroidery on fabric scraps, made adjustments and tested them again. Then I took a deep breath and started to embroider directly on the panel. One error and the whole project is a goner. I was very lucky – the Jacob’s Creek logo embroidered nicely each time and the serve speed readout turned out crisp and a good size. 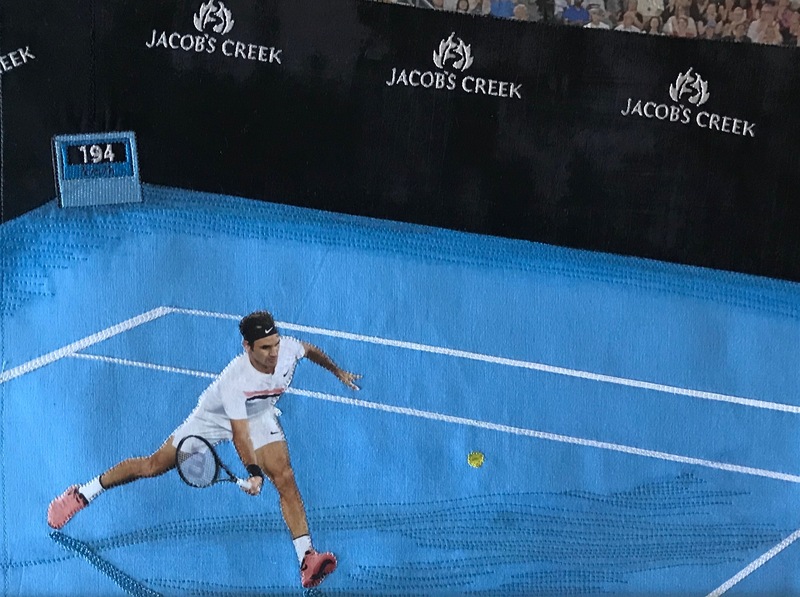 Before doing the embroideries, I’d shaded the court and thread painted the surface adding the shadows beneath Federer’s feet (both feet are about 1″ above the court surface – he’s actually in the air in the original photo) as well as the lighter shadows cast by light coming from another direction at the end of the court. I’m still thinking about whether I want to put in any shading on the court walls or not – if you click on the image you’ll see I used a shaded fabric (Grunge by Moda) – I’m not inclined to follow the random pattern of the fabric; were I to add thread painting, I’d mirror the shading I used on the court. I’ve stopped for now. I’ve stitched around Federer himself using a fine clear (invisible) monofilament thread. I will likely stitch the shadows on his clothing and body and indicate the colour changes on his shirt, socks, and shoes. Tomorrow. I’ll look at it again tomorrow and see what I think then. I also have no idea yet what to use to bind/border the panel. When I get the thread painting done, I’ll trim the panel, add the narrow silk inner border, then see what I have in my stash that might complement the panel itself and bring out the colour in it.